Spider powers are hard to come by these days. The comics make it seem like it happens to just about anyone! Peter Parker, Miles Morales, Ben Reilly, Gwen Stacy, Miguel O'Hara all got powers in one form or another, but it seems that normal guys just can't catch a break. 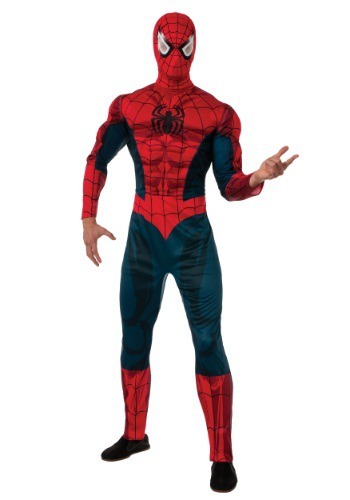 The good news is that you can wear this Marvel Adult Spider-Man Costume and feel like a superhero from the comic books. It has the classic blue and red design from the comics and will soften the blow about still not having the spider powers that you've dreamed about since being a kid! 1) The body of the costume is quite loose / ill-fitting. 2) The eyes are just holes. 3) The mask does not reach the suit. 4) The back does not close easily, if at all. It is also easy to get overheated in the suit, perhaps because of the material its made of. I would not recommend to someone that I like.